These pictures were taken at the same time of the year. 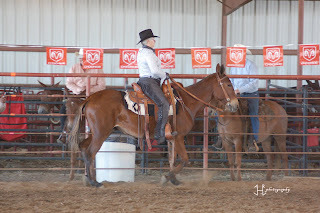 The one with Rosie and I crossing the bridge was last year (2008) at the IDMS State Show and Futurities. The other picture is at the IDMS show this year. I have lost 55# but didn't really notice it that much until I compared these pics. I am doing some ground work with my three year old and will not be riding her again this year. Rosie and I have some serious trail riding to do. We will have a horse and mule fun show in Ottumwa on 10/04 and we'll go to the Tim Christopher Biannual All Mule Ride in Decorah on Oct. 10. Then Jeanie and I will be going to Eminence, MO the last week in October. That's about it execpt just fun little rides here and there. Winter will be here before we are ever ready for it!! The pics are great too. Sounds like you have some exciting trips coming up. I just rode Siera at Wildcat today...whooo! Can you believe the difference in the profile in one year. It was unbelievable to me the difference. 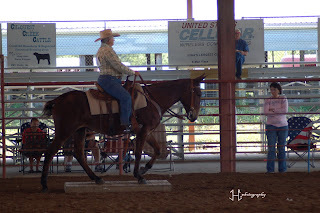 Riding at Decorah helped me to be able to have enough confidence to believe in my mule. Old Rosie keeps you safe. Had an offer on her at the state show. Priced her at $50,000 cash!! No offers yet!! lol~~~I tell folks that Badger is "priceless". Kelli French sold him to me as a 2 or 3 yr old, and she rode him first. I owe Kelli so SO much! There is no way I am about to sell the riding mules we have. Rosie and Eve can be ridden by anyone who can balance in the saddle and both are pretty lazy so less chance of them loping off. Kelli and Chris are great people. They have always been happy for us when we have any wins. Sue showed Angel against Chris in the 3 year old futurity and both of them congratulated Sue, Bill and I. That means a lot! !